Get to know every professor you can. Get to know the professors in your department, even if they don't teach any of your classes. You'll never know what you might learn from them. 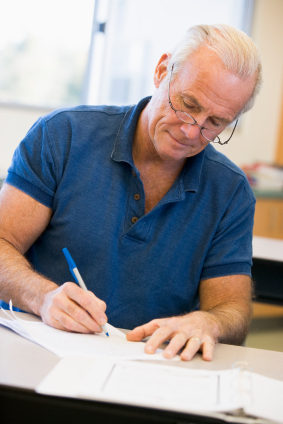 And find out what resources are available to adult learners to help you stay on track. Most colleges offer tutoring services, academic counseling, or workshops to ensure you excel in, and more importantly, enjoy your classes. Don't lose sight of your priorities. Once you have a strong academic footing, you can figure out how to get involved in extracurricular. Getting involved allows you to bond with your peers, get to know the faculty, and network with potential employers -- all added benefits of the college experience. Just make sure you're prioritizing your time. No one wants you to get burned out from stretching yourself too thin. Understand what you need to do for your academics, family, job, and community, and then you can start exploring extracurricular activities. Join programs inside and outside your field of study. There are pros to doing both. If you're in the legal studies program, joining the Paralegal Student Association can help you meet fellow adult learners and professionals with the same interests as you. But you'll meet all kinds of adult learners from across the board by participating in something like the First Year Initiative (FYI) program, where you'll meet other people who are just starting to earn their degree. Find what interests you, and see how you can be a part of it. Connect virtually. Online-only students can get involved too! Even if you can't make it to campus, online student meetings or associations can help you get to know your peers and your school. No matter how you attend your classes, getting involved will help you network with others and feel connected to your college community. Even if you're not ready to fully commit to joining an association, try to come out for one or two activities to see what they're all about. Lean on your support network. To stay on track in the upcoming school year, set your priorities and then rely on your support network for help. You have to know where it's most important to spend your time, and allocate accordingly. Sometimes life will get in the way, and it might throw off your schedule. If that happens, it's OK to rely on your support network for help until you're back on track. I hope you find these guidelines useful as you strive to balance work, life, and earning your college degree. What are your plans for staying on track this school year? Let us know in a comment below!